The Shenandoah Valley, Harrisonburg and Rockingham County played significant roles during the war. Harrisonburg was at the crossroads of two major highways, the Valley Turnpike (modern-day Rt. 11) and the Rockingham Turnpike (modern-day Rt. 33), and about 25 miles North of a huge Confederate rail and supply center in Staunton. At the time, Rockingham County was one of the most prosperous agricultural counties in the nation. The region including, Harrisonburg and Rockingham County was known as the “The bread-basket of the Confederacy” resulting in a prime location for the struggle between Union and Confederate forces. The Valley also set the stage for two important campaigns during the American Civil War; Confederate Gen. Thomas J.”Stonewall” Jackson’s famous 1862 Valley Campaign, which earned him a permanent place in military history, and in 1864 when Union Gen. Philip H. Sheridan ordered “The Burning” of the Valley. Harrisonburg and Rockingham County are home to 30 Civil War Sites, including 6 Civil War Trails markers in historic downtown. 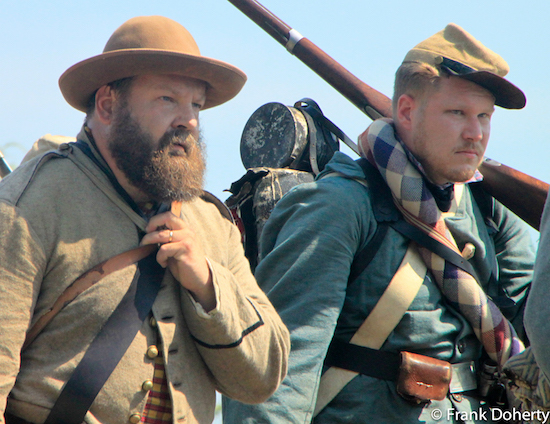 Visit the Harrisonburg Rockingham Civil War Orientation Center for more information. Download your visitor information for Civil War Travel in Harrisonburg and Civil War Travel in Rockingham County. Trails sign on North Main Street between Bruce and Franklin streets in Harrisonburg – Home to the town’s first mayor, Isaac Hardesty, this house was used briefly as headquarters for Union Gen. Nathaniel Banks as he tried to corner Stonewall Jackson in 1862. Located within the Hardesty-Higgins House Visitor Center visitors will find The Valley Turnpike Museum and the Harrisonburg Rockingham Civil War Orientation Center. The Valley Turnpike Museum highlights the history of the Rt. 11 corridor as the avenue of invasion and events surrounding 1862 Harrisonburg and engine 199, recreated in a scale model. The Civil War Orientation Center offers visitors the stories of individuals, battles and campaigns through film and interpretation. Harrisonburg was Rockingham County’s seat of government and largest town, and it was an ideal site for a hospital. When the Civil War began in 1861, although the railroad had not yet extended to Harrisonburg, the town sat at the intersection of four turnpikes, including the Valley Turnpike, the main avenue for travel through Virginia’s Great Valley. Various buildings in Harrisonburg were used as temporary hospitals from the outset of the War; the most important of these was the Harrisonburg Female Academy at this location on Main Street. It was converted to hospital use in 1861, and was known as the Harrisonburg Confederate General Hospital. Trails sign on North Main Street between Franklin Street and Ash Tree Lane in Harrisonburg – in front of the Virginia Quilt Museum. This was the home of Edward T.H. Warren, a Harrisonburg attorney and descendant of Thomas Harrison, the founder of Harrisonburg. Warren went to war early and fought in most of the famous battles in the East until he was killed at the Wilderness in 1864. The structure was used as a hospital following the battle of Gettysburg in 1863 and it was here that Stonewall Jackson’s “Boy General”, Joseph Latimer, died. Today, the historic home is open to the public as the Virginia Quilt Museum and interprets the history of the building. The museum also highlights the importance of quilting in society with contemporary and historic quilt exhibits throughout the year. Capt. John Hanson McNeill’s company of the 18th Virginia Cavalry became a Confederate partisan ranger unit on March 20, 1863. Nineteen days earlier, McNeill auctioned captured “horses and harness” at the courthouse in Harrisonburg for $36,000. On the morning of October 3, 1864, Capt. McNeill was mistakenly wounded by his own men while leading an attack on a Union camp in Shenandoah County. He died of his wounds on November 10 at Hill’s Hotel in Harrisonburg. Lt. Jesse C. McNeill, the captain’s son, soon took over command of the company. A plan had been developed two years before; Captain Jesse McNeill had heard his father boast about a raid he was going to make into Cumberland, Maryland in order to capture two Federal generals. The prospective victims were generals Benjamin F. Kelley and George Crook. Woodbine Cemetery was chartered in March 1850. Later that same year a lot was purchased for burials when Harrisonburg’s first mayor Isaac Hardesty sold 2½ acres to the cemetery company. Woodbine was developed as the town’s main cemetery, and the need for gravesites for fallen Civil War soldiers became apparent early in the conflict. The nearby action where General Turner Ashby was killed and the battles at Port Republic and Cross Keys added additional burials, as did fatalities at Harrisonburg’s Confederate General Hospital. A one-acre lot was donated by Harrisonburg merchant Samuel Shacklett for a “Soldiers’ Cemetery.” In June 1868 women from the town formed a Ladies Memorial Association, led by Mrs. Juliet Lyle Strayer. The Memorial Association provided care and maintenance for the graves of fallen Confederates buried there. 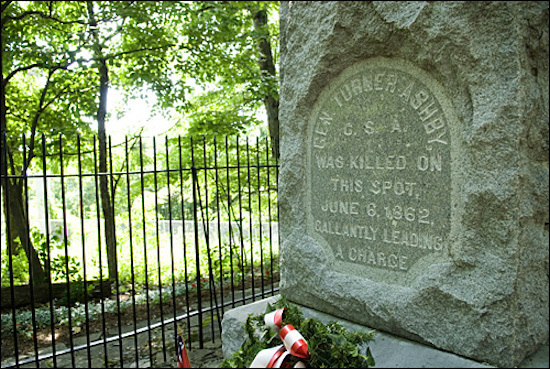 Gen. Turner Ashby, in command of Jackson’s cavalry, was mortally wounded at this site now marked with a monument and a small park. His death, June 6, 1862, immediately preceded the battles of Cross Keys and Port Republic. Walk to two Civil War interpretive signs about the engagement at “Chestnut Ridge” in 1862 where T.A. was killed, and another one depicting “The Battle of Harrisonburg in 1862” on the same day. The Turner Ashby Chapter of the United Daughters of the Confederacy No. 162 holds annual memorial observance of the death of Confederate Gen. Turner Ashby in June each year. Visitors and Group Tours are welcome. We invite you to pick up more information on the American Civil War and visit the Harrisonburg-Rockingham Civil War Orientation Center, located in the Hardesty-Higgins House Visitor Center. The unique history of Harrisonburg and Rockingham County includes the settlement of a large group of Mennonite and Brethren-whose religious beliefs and role during the war are highlighted at Crossroads: Valley Brethren-Mennonite Heritage Center. Primarily Union sympathizers, several events during the war, such as Sheridan’s Burning did not favor the southern Unionists; Valley Mennonite and Brethren lost their farms to fire as well. The thriving Valley town of Harrisonburg, Virginia experienced conflict and bravery, challenges to hearth and home, God and Country.